Ok, I’m back on track. Mamapreneur Monday and it’s actually Monday….yeah for me! Here is my 2nd mamapreneur showcase of 2009. If you missed the 4 that I featured at the end of 2008, please check my archives. We got insight into the businesses of Lindsey Foley; personal stylist, Kerri Romano; stylist and makeup artist, Hannah Fisher; creator of Binky Bling and Monica Taylor of AbbaDabba Bags! 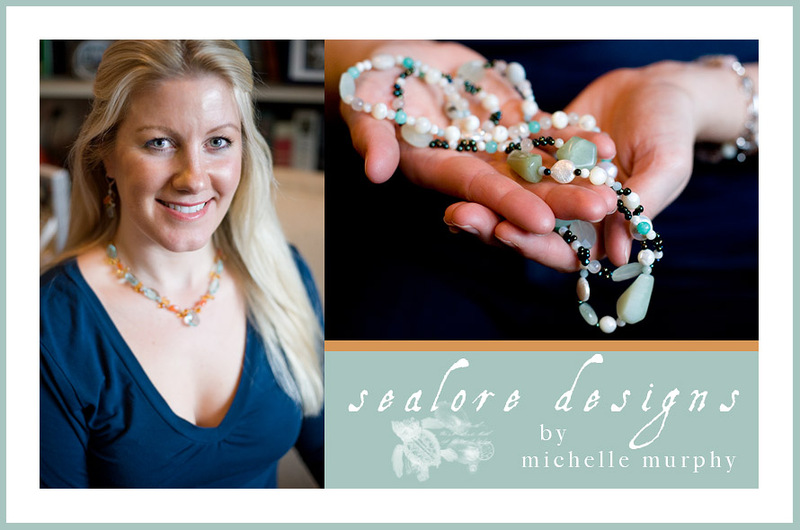 I met Michelle Murphy, of Sealore Designs one late afternoon a few weeks ago in Scituate, MA. What a big, beautiful, welcoming family! Another Wonder Woman who is doing it all and raising a family. Hats off to her…and here is her story. I was sitting on the beach watching the kids play in the sand and sea, it was sunset and the golden tones of light flickered in their golden hair and about them, meanwhile I had my journal open and was writing different names I had been thinking of and stopped to think about how alluring the sea is and how I almost feel like the sea is pulling me, as the moon pulls the tide back to sea and how the sea has been such a huge part of my entire life. I started daydreaming about how I went on my first sailing trip when I was only 3 months old with my parents to Outthink Island on their new sailboat. Cuttyhunk was a seven hour sail from the boat’s mooring at my grandmother’s cape house in Sias Point, Wareham. Much to my grandmother’s dismay she watched my parents set sail with me being only an infant. I spent all of the summers of my entire life sailing with my father and returning to Cuttyhunk Island many times and the very last time was to spread my father’s ashes in the sea. We spread his ashes along with a wooden sailboat In an area of the ocean off of Cuttyhunk known as Norman’s Land where my grandparents ashes were once spread by my father himself on a sailing voyage. While I sat there on the beach thinking of all these things I was so taken by the realization that the sea was such an integral part of me and how we moved to Scituate from Boston after my father died drawn mostly here by the sea once again and how my oldest son Kyle who is blind is happiest swimming in the sea – its one of few things he can truly do with out relying on someone to help him and he is such an amazing swimmer with this huge smile upon his face. All the while I was writing these thoughts in my journal and looking up to watch my children relive these same wonders, I couldn’t help but be overcome by the feeling that my father along with the stories, the lores of the sea were calling me. SEALORE I penned on that page in my journal and there it was! I also wrote a poem about all these thoughts and that poem is on my website and all the tags of my designs. Please explain a little bit about your product/business and how you developed the concept behind it: I started making jewelry as a teenager as gifts and my mom would sell some of the pieces at work (at least she told me she sold them). Since then I have off and on only to put my tools away with all the demands of a house with five children. I decided for my birthday last year that all I wanted was to seriously start making jewelry and so I did. The jewelry pieces I design and handcraft are each inspired by something related to the sea and astrology, there so intertwined together the way I see it. The moon is the pull of the sea. What makes your product/business so unique? The symbolism, beauty and originality of each piece I craft is what customers say. Everyone likes to be reminded of a day at the beach or feel like a mermaid who is decked out in sea treasures a lonely sailor made while out at sea. What is the hardest part or have been some of your struggles starting your own business? Managing the children and their busy schedules along with my business. Making marketing decisions when I have no background in marketing. How many children do you have? What are their ages? And ages when you started your business? I have five children: Kyle, Gaelyn, Laurel Rose, Braeden and Andrew. They range in ages from 4 to 17. The eldest of the girls....she loved the camera! 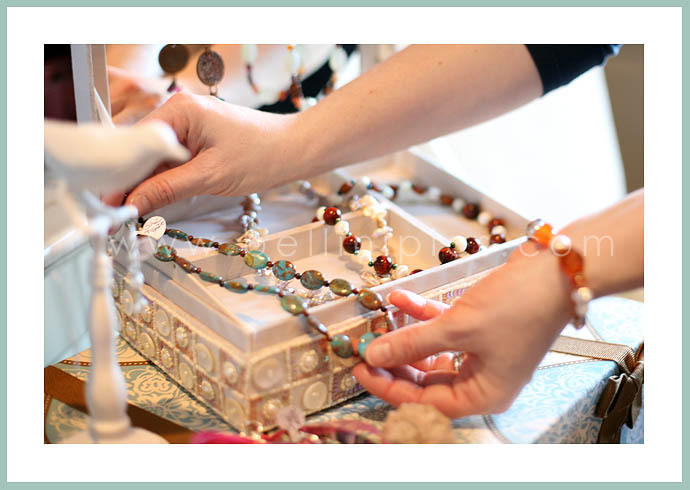 What are some of the creative ways you have found to juggle being a woman, a mother, a business owner, and a wife? Always have a bottle of wine handy! Or in other words always be able to laugh. I also have my daughters help me sometimes and they really enjoy this time we spend together and meanwhile it teaches them how a women or anyone can do anything if you set your mind to it. The women of the house! Now for some fun and easy questions…. Favorite meal? Oh gosh my nickname is “chowy” so this is so hard. But I guess I’d have to go with a tuna melt or crab cake with lots of tomatoes. I eat a tomato just about everyday- love ’em. On any given day, what makes you smile? Looking at my children and recognizing how unique and beautiful they are each in their own different way. Also dancing with the kids, we all love music and having dance offs. When you have free time (ha!) what would your ideal day entail? Sleeping in really late, followed by my husband’s famous breakfast, a family hike at one of the local trails by the beach, then promptly being dropped off at SpaScape for the works and being picked up after for a nice dinner out in Scituate Harbor. The best part of this day is I get out of mealtime for all three meals and wont be home long enough to have to do laundry or clean! Carrie - An amazing write up!!! Kudos to the writer & to the MAMAPRENEUR!! Congrats Michelle!!! Lots of luck with your business! Janine - Absolutely gorgeous photos and excellent article. Great job Chowy, best of luck and continued success!!!! michele - what a great story stephanie! beautiful images to boot! thanks for sharing. Marisa Mirrione - great story and beautiful pictures!!! Loba - Love it!! It’s great to see the beautiful pics of you and the kids. I’m so impressed by your talents both with the jewelry and your inspirations- thanks for sharing them!! Dad & I are very proud of you and your gorgeous family and lets not forget Brian in this deal too! I guess your talent & creativity must all come from your mother? Suzanna Colton - This was such a beautiful article and I am so proud of you!! You continue to amaze me year after year, to be an amazing mother of 5 and run a business…you are truly an inspiration!! Love you!!! Erin Carlyle - Beautiful pictures and wonderful article! Enjoyed it all! 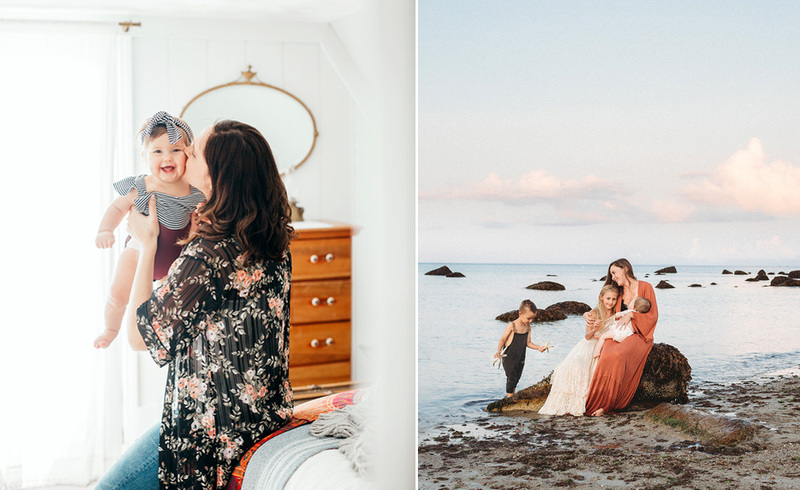 jami - Stephanie, great pictures and wonderful article and what a beautiful mamapreneur! Alyssa - Great article – it is your best yet in the mamapreneur category because it was so personal and really showed all of her loves.